I'm so delighted to have my friend Jeff Abbott on the blog today! I have been a huge fan of his for years, starting with his novel PANIC, which I picked up and read because Harlan Coben called it one of the best novels of the year, and he was absolutely right. I was blown away, and immediately began gobbling up all the books I could find with Abbott's name on the spine. OK, enough of my gushing. You need to read him. STAT. INSIDE MAN is his brand new Sam Capra thriller. Get it. Right now. Go, go, go. Done? OK. Let's get started, shall we? The melancholy, spacey song “Twilight Zone” by Dr. John, from his Babylon album from 1969. I admire his career longevity. The fifth Sam Capra novel. Sam Capra is a former CIA agent who owns bars around the world, and continually finds himself drawn into the dark, shadowy world of international crime. Sam is very much a guy who comes to the aid of those in need. He’s tough and smart, but he’s also rather young—in his mid-twenties—and he isn’t quite as experienced as he thinks he is. INSIDE MAN is the fourth Sam Capra novel, where Sam goes undercover into a criminal family in order to find out the truth behind a friend’s death. Shakespeare’s King Lear was a clear influence on this story: the leader of the family is dividing his business empire between his three very different children, and if Sam makes one wrong move, he’s dead. Of course nothing goes as he plans—and nothing about this family is as it seems. I wanted to write a big international intrigue story that was wrapped up inside a big family drama. I hope I succeeded. 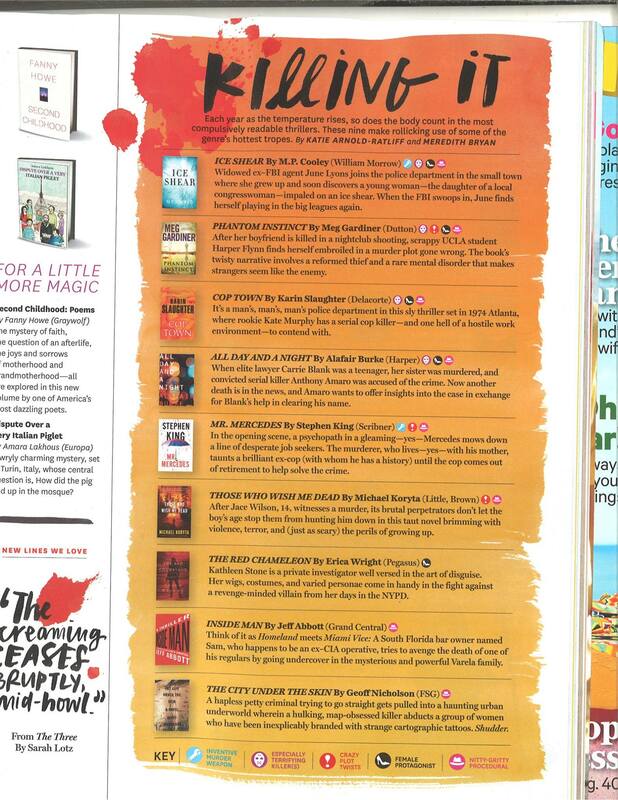 INSIDE MAN was an Oprah, the O Magazine pick for its summer reading list. I write in my home office. I write the first draft in Scrivener, and subsequent drafts in Microsoft Word. When I want to be away from the office, I write on an Alphasmart Neo, which is a text processor with no web functions. I get more done unplugged. I keep all my notes on paper, in a Clairefontaine notebook. Madeleine L’Engle’s A WRINKLE IN TIME. Finish what you start. You can’t keep going back and rewriting what you have. You cannot edit a blank page. So stop rewriting your partial manuscript (people seem to do this a lot, at those who ask me for advice), and finish that first draft. You will have a much better idea of what rewriting needs to happen if you’re working with a complete manuscript. Go for a walk or a swim. Read a favorite classic story. Play with my dogs. If I am quiet soon enough the words will come back. Being a good father and husband, and for being a writer who delivered an entertaining and thoughtful read. Jeff Abbott is the New York Times bestselling, award-winning author of many mystery and suspense novels. He has been called “one of the best thriller writers in the business” (Washington Post). His novels have been called “compulsively readable” (Chicago Sun Times), “outstanding. . .genuinely moving” and “fresh, original… intricately woven” (Publishers Weekly), “nail-bitingly suspenseful and totally original” (Irish Independent), and “extremely compelling” (Associated Press). He is published in many languages and has been a bestseller in the US, the UK, Ireland, France, Germany, Australia, Portugal, and other countries. His novel Adrenaline was a Summer Great Reads choice by both The Today Show and Good Morning America. Jeff is a winner of the Thriller Award (for The Last Minute) and was nominated for the Thriller Award forPanic. He is a three-time nominee for the Mystery Writers of America’s Edgar Award and a two-time nominee for the Anthony Award. Jeff’s first novel, Do Unto Others, won both the Agatha Award and the Macavity Award. His novels Adrenaline, Panic, and Collision have been optioned for film and are in script development. Jeff graduated from Rice University with a degree in History and English. He lives in Austin with his wife and two sons. Sam Capra’s friend Steve has been murdered, shot dead in the rain outside of his Miami bar. The only lead: a mysterious, beautiful stranger Steve tried to protect. To avenge his friend, Sam goes undercover into the Varelas, one of Miami’s most prominent and dangerous families. Now on the inside, playing a part where one wrong move means death, Sam faces a powerful, unstable tycoon intent on dividing his business empire between his three very different children, who each may hold murderous secrets of their own. Sam is relentlessly drawn into this family’s intense drama, amplifying painful echoes of his own shattered relationships as a son, brother, father, and husband. And just when he thinks he understands why the family is self-destructing, he discovers a lethal secret so shocking that the Varelas cannot let him walk away alive . .